I have two shops that I passionately divide my time designing for. 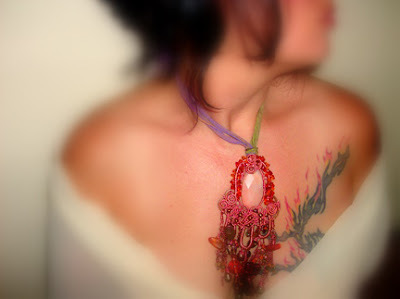 My first shop on Etsy.com is Jewelry by Reshell. I’d say it’s my more modern contemporary urban styled boutique. with a flare for old classic styles and trends, with a touch of my own modern twist. My second shop is called Stone & Bone, which is a tribally styled native inspired collection, incorporating bits and pieces of traditional materials as well as spiritual symbolisms, and giving it an abstract, yet metaphoric modern twist to my ancestral lineage. 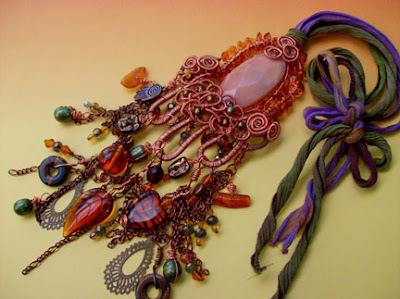 I first had only Jewelry by Reshell, as my main platform for exhibiting and selling my jewelry. But being the Gemini that I am, One was just not enough. Plus, because my style and range varies according to my moods, and materials that I’m in love with at the time, I just needed another venue to support my native work, that’s when my second shop Stone & Bone was born. I chose to separate my jewelry styles so that my target audiences could have an easier time navigating through thousands of jewelry sites. Keeping it simple and easy to locate, is half the battle of selling on the web. What kind of training did you have which helped you to achieve your current level of artistry? I’m a self created artist on all disciplines that I love to do. I’ve been drawing, painting, and beading since I was 4 years old. I can’t imagine my life with out arts and crafts, all of them. I’m an addicted artist, no matter what the medium I’m working with. It consumes me. As far as being a professional and making a living off of what I do, I’ve sold my work from the start. I always wanted to be in business for myself, and art was and still is the vehicle to my success. My jewelry business on Etys.com has giving me more exposure and venues to reach farther, and has allowed me to make contacts with other professional in the field, that has helped me to grow even more. Oh yes, I can’t imagine my work as a jewelry designer with out wire. I’m just crazy about all things wire. It’s the most amazing material to work with. 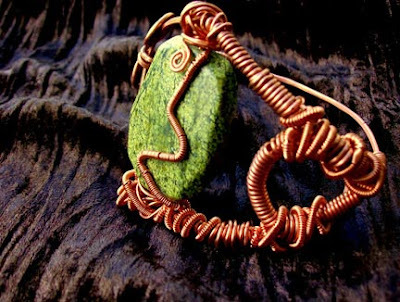 My work has taken a whole new life since I’ve incorporated wire into my designs. I see it now as a means to create more structural pieces, where as before, I felt my work was limited and lifeless. Let me not forget, my most favorite tool of all is my ring mandrel, with out it there’s no way I could create My Chunky Dinner Ring Collection. Trust me when I say without it I would be lost. Ah, alas I’m an artist, it’s who I am. If I didn’t create, my life would cease to exist.. It’s in every thing I do. I know I sound so dramatic, but there’s never been a day that goes by that I don’t create some form of artwork. To me life it’s self is inspiration. I’m an artist, I can be no other. I’m not one to give advice, or seldom take it. Unless I truly feel it in my bones. But what I tell myself everyday is , “Girl, you’re very luck to be able to do what you do. Love it, live it, and most of all share it with whoever wishes to be apart of the process. That’s all that matters, the rest will take care of it’s self.” Life finds away to make it happen, and passion fuels the rest. My work does get stressful at times. But I’m the one putting the stress on myself. I’m my worst enemy or my greatest alley. I’ve learned to step back and let it be (the Beatles had it right), and it’s worked itself out every time. What takes up the majority of your time? My family, I’m a wife, a mom, and a grandma. I love my family all very much. But they know if I’m busy working on a project to give me my space. They know if I’m not doing me, which is my artwork, I’m not going to be able to be good for them. Because it’s been my work as an artist and designer that provides for my family, and they understand that. In closing I just wanted to say, In loving who I am, my work has improved, finding my niche and following my heart has shown me that anything is possible. I have high standards for my work, but I also know that the moment doesn’t always turn out the way I envisioned. It’s turned out better. So do what you do and love every minute of what you do, and the rest will follow.